Every year we plant corn. We have never had a harvest of corn, but nevertheless we put it in the ground every year. There comes a time when the corn is about ready to be picked and it must release an odor that the cattle get and we don't. One year the herd pushed the smallest member through the electric wire and then ate every ear and almost every stalk in about 10 minutes. There was no stopping them. And corn takes about 100 days to get to where there are actual cobs available, so 10 minutes of consumption after 3+ months of clearing, planting, weeding and generally babying the corn patch was pretty discouraging. There are those worms that get into the tassels of most corn, easy enough to cut the top of but most people object to bugs in their food. We planted Country Gentleman, a shoe peg corn, this year. It is an old variety that grows ears that have random placement of the corn kernels on the cob and a very tight twist of the husk at the top, where the silks are located. This tight twist is said to be difficult for the ear worms to traverse, reducing their damage to the corn. The field was prepared with plastic covering, holes burned in with the fresnel lens. The field is well fenced with electric and wire fencing. We will grow goofy, uneven kernel corn here. The kind of sweet corn that is delicious cooked and eaten within hours of picking, but will never last the process of getting from farm to truck to warehouse to store to kitchen. And we are ok if the top part of the cob needs to be cut off and fed to the pigs cause there is a worm in it. Each year we grow here we witness more good bugs appearing. The pea plants are massive and covered with flowers, even when chopped back they still keep growing and producing. No peas yet, but soon! The aphids we saw early had no impact on our ability to produce peas. Corn ear worms have the same kinds of animal control as aphids do. There are wasps, lace wings and soldier bugs that will all eat up the corn ear worm. And the lovely songbirds that just live a fat grub. 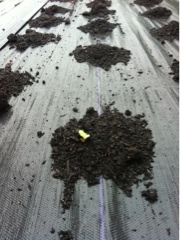 We will keep growing soil that is healthy and full of compost and humus. We know there are thousands of growers that provide perfect vegetables, all identical to each other. We will continue to grow food that can reproduce itself, that is fertile, in an environment that supports many life forms, and we will continue to produce all that we can with as few inputs as possible. In the fall we will have knives ready to cut the tops off our Country Gentleman if a worm or 2 gets in there. We will have a pot of boiling water set up by the field, and butter from a grass fed cow ready to slather on it. And every means needed to keep the cattle out of there! All systems are in place for a corn harvest this year. We hope. If not, next year we will change things up and try again.